A couple of friends of mine receive CSA boxes. For those of you who don’t know what a CSA box is, it stands for “community-supported agriculture.” You have to join a CSA program and every week, you go and pick up your box, in which there will be a collection of produce based on that week’s crops. It’s basically a “what’s ready” box. You’re getting farm-fresh local and seasonal produce and you are supporting your local farmers. As much as I believe in local and organic produce and sustainable farming, CSA boxes are not practical for me because when I do have time to cook, I have to focus on recipes that I must make. If you’re a food writer like me, you know exactly what I’m talking about: There are specific recipes that need to be tested, dishes to be photographed, events to cook for… We cook with an agenda, and cooking just for pleasure is a luxury. At any rate, these friends were going away for a week and would not be able to use all the produce in their CSA box. 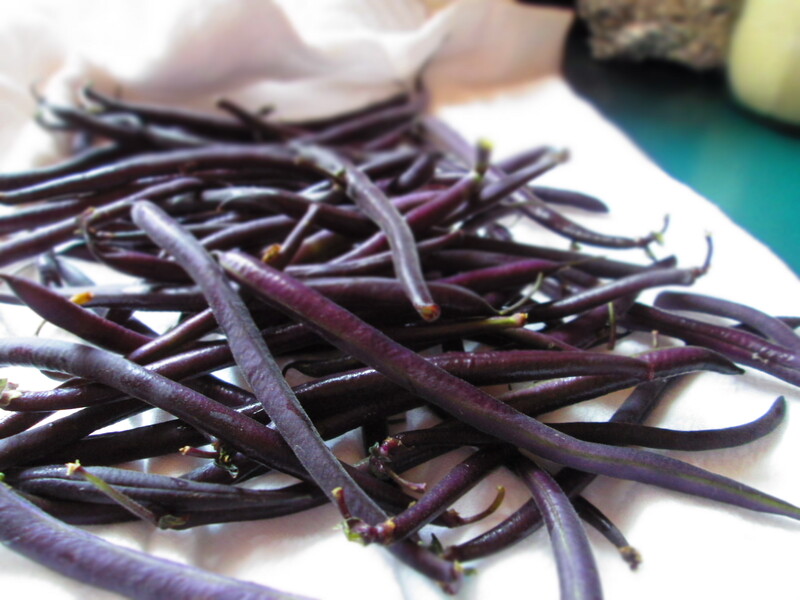 They offered me a few items, including some beautiful purple haricot vert. 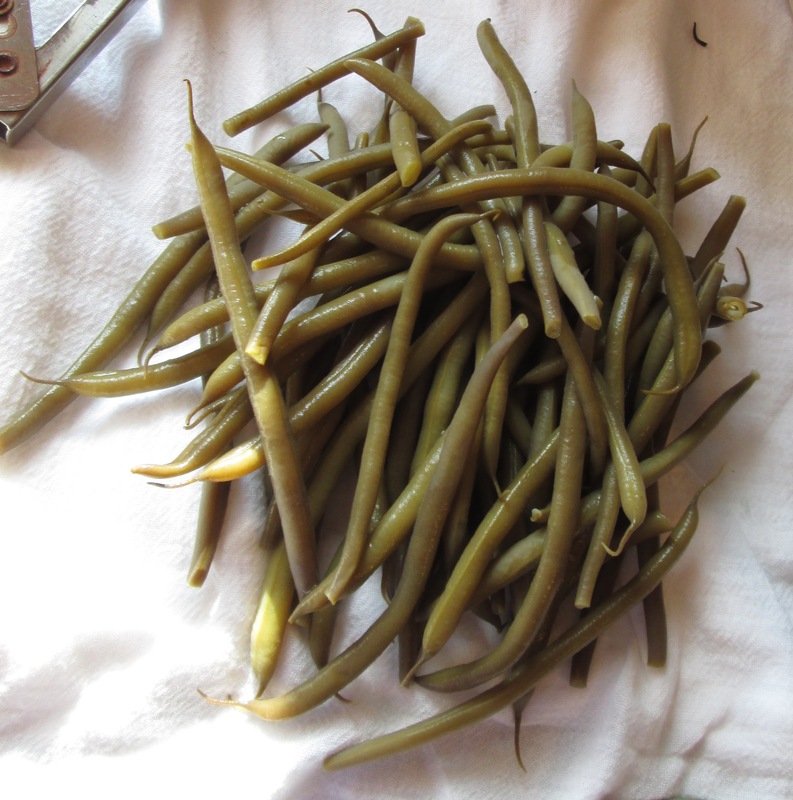 It was my brother’s birthday this past week and my mother wanted to cook him a special lunch with the whole family, and I thought it would be a nice to bring a fresh green bean salad, using the purple haricot vert. 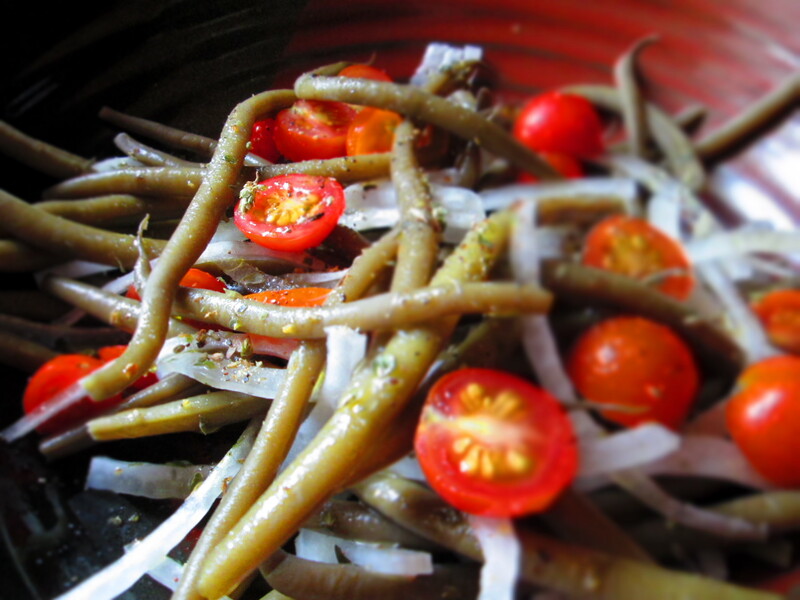 This salad is simple and fresh and you can appreciate the grassy notes of the beans. Note that purple beans will, sadly, turn green once cooked. It’s such a shame that they can’t retain their dazzling color. The vinegar will at least keep it a vibrant green. Bring a medium saucepan of water to a boil; add the beans and vinegar. Return to a boil, then lower the heat and simmer until tender but still firm. Drain and run under cold water. Drain well and place in a serving bowl. Add remaining ingredients and gently stir. Taste and adjust seasonings, if needed. 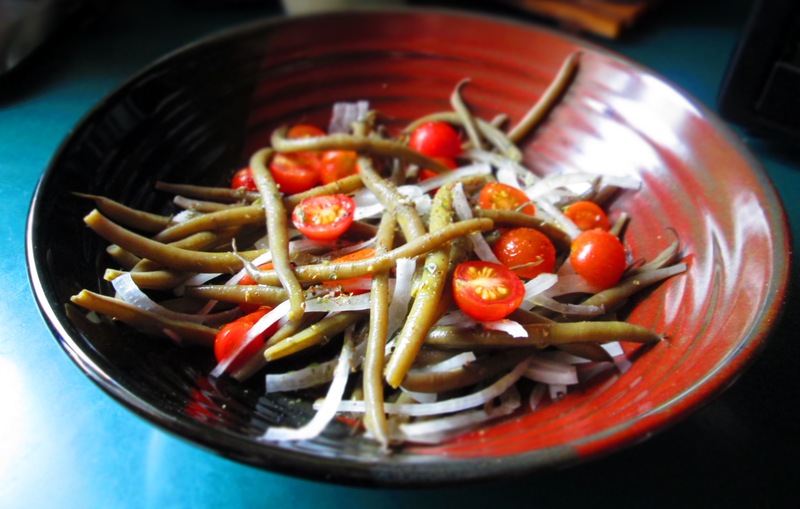 Categories: Gluten-free, Healthy eating, Recipes, Salads, Savory Cooking, seasonal cooking, Uncategorized, Vegan, Vegetables, Vegetarian | Tags: green beans, haricot vert, salad, vegetables | Permalink.